Ganesh Chaturthi, the birth anniversary of Lord Ganesha, is celebrated with great pomp and show in India. It is a popular Hindu festival that is celebrated in a grand manner every year According to the Hindu calendar; the festival comes on the 4th day of Bhadarva Shukla-Paksh and falls around August or September. 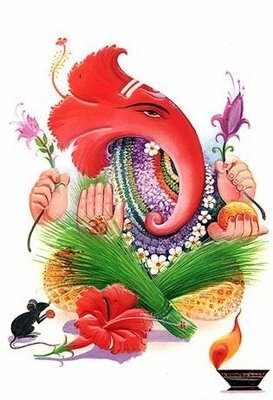 This year - 2011, Ganesh Chaturthi falls on Thursday September 1st. India is a land of festival and celebrations and Lord Ganesha is known for his inclination towards sweets. Therefore, a festival dedicated to Lord Ganesha will always be incomplete without special sweet dishes. There are a variety of sweets made on this occasion, with the most popular one being Modakam / Kozhukattais. Let us celebrate Ganesh Chaurthi with all His favourite dishes and may we all be showered with the Blessings of Lord Ganesha, the God of Wisdom and intellect, on this auspicious Day. *Coconut oil or any other cooking oil: 2tsp. 1. Melt the jaggery and strain to remove any impurities. Reheat and make a slightly thick syrup. To test, just remove the spoon with a little syrup from the boiling syrup and drop into a cup of cold water. If the syrup forms a smooth ball, soft to touch, it is ready. 2. Add the coconut gratings to the molten jaggery. Keep stirring until all the water is absorbed and the contents leave the side of the pan. 3. Remove from fire and add cardamom powder. This stuffing can be prepared in advance and refrigerated up to 1 month. This keeps good in room temperature for up to 1 week. 1. Soak Bengal gram dhal in water for about two to three hours. 2. Cook the Dhal in water till soft, but not mushy. Drain the excess water. 3. Grind the cooked dhal to a coarse powder [You should not use any water - only dry grind]. 4. Put the jaggery in a heavy bottomed vessel and add ½ cup water and keep on low flame. When the jaggery completely melted, strain it and put it in a heavy bottomed vessel and bring to boil again. 5. When it starts boiling, reduce the heat and add dhal powder and mix well. Stir now and then and cook till it is solid. 6. Add coconut gratings and cardamom powder and mix everything well. Remove from stove and let it cool. 1. Dry roast sesame seeds on a slow fire to a light brown colour. Cool it. 2. Powder it in a mixie. Powder the jaggery well. 3. Put it in a mixie and run for one to two rounds. Before removing, add ellu powder and cardamom powder and again run for one to two rounds. 4. Remove it, add melted ghee and mix well. 1. Heat a pan and add 2 tsp of oil. 2. Add 1½ cups of water and pinch of salt and boil. 3. Meanwhile mix the rice flour in1½cups of water into a smooth batter without lumps. 4. When the water starts boiling add this batter and keep stirring until the rice flour becomes a smooth shiny ball. 1. Knead the rice flour dough well. 2. Take a lime sized portion and form into a cup. 3. Smear little oil on your finger tips to make it easier to handle the dough. 4. Put a smaller size ball of the coconut stuffing inside and close from all sides and pinch the ends together. Repeat till all the dough and stuffing is used up. 5. Steam the kozhukkattais in a steamer or a idli steamer for 15 minutes. Tips: If banana leaves are available place the kozhukkattais on the banana leaf and steam.The kozhukkattais will not stick to the plate. If you find it difficult to make rice cups, you can use Kozhukattai mould, which is readily available in the market/stores.